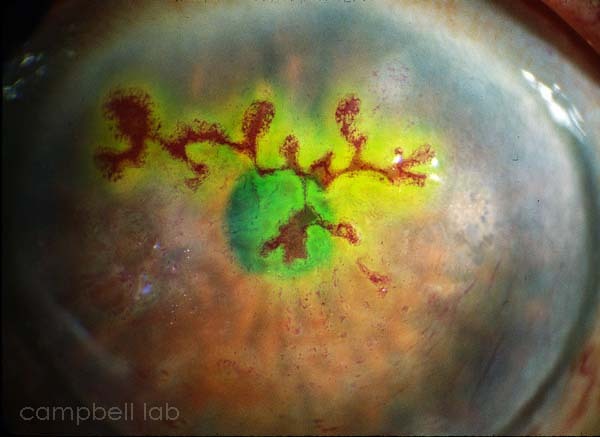 The detection of Herpes Simplex (HSV) from ocular specimens is essential for prompt and accurate therapy. HSV can be detected from ocular samples with PCR, AmpliVue™ HSV 1+2 Assay, cell culture, and ELVIS™ (Enzyme Linked Viral Induced System). In our laboratory, all clinical ocular samples suspected of possible HSV infection are tested with PCR and AmpliVue™ HSV 1+2 Assay. Specimens are directly collected by vigorously swiping the exposed conjunctiva with a plastic soft-tipped applicator. Cornea samples using soft-tipped applicators and spatulas can also be obtained to maximize the yield of viable HSV and antigen. Topical anesthetic can be applied to the conjunctiva and should be applied to the cornea. Collected samples are placed in 2.0 ml of viral transport medium. We have had great success with Bartels ChlamTrans™ chlamydial transport medium and recommend its use. Viral culturettes can also be used for transportation to the laboratory and these can be transferred to the viral medium. 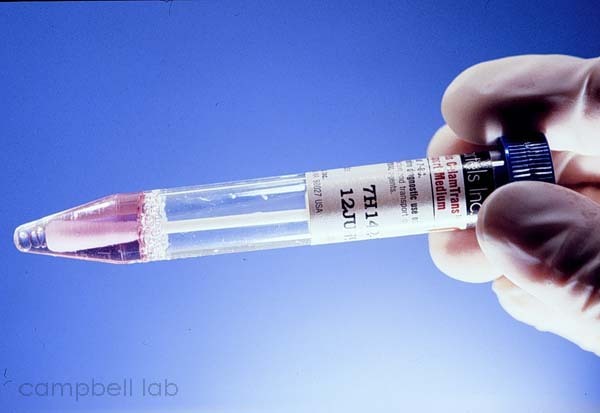 All laboratory testing can be processed from the 2.0 ml of chlamydial transport medium. HSV can be fastidious and should be transported to the laboratory without unnecessary delay. PCR is performed for HSV (1 or 2) on specimens collected by soft-tipped applicators, metal spatulas, or jeweler's forceps, and placed in 2.0ml of chlamydia transport medium. Intraocular fluid or vitrectomy specimen can be supplied directly or increased to a volume of 0.4 ml with chlamydia transport medium. 0.4 ml of the medium is supplied for PCR testing. AmpliVue™ HSV 1+2 Assay (Quidel) is a rapid colorimetric test for the qualitative detection and differentiation of Herpes simplex virus (HSV-1 and HSV-2) nucleic acids. Specimens are collected the same as for PCR- by soft-tipped applicators, metal spatulas, or jeweler's forceps, and placed in 2.0ml of chlamydia transport medium. 20 ul of transport media is used for the test, which can usually be completed within one hour and ten minutes. The "gold" standard for HSV laboratory testing is cell culture. Collected samples are layered on a monolayer of cells in test tubes. If present, HSV will present as cytopathic effect of rounded cells. We have use A549 cells as the cell-line for testing HSV. 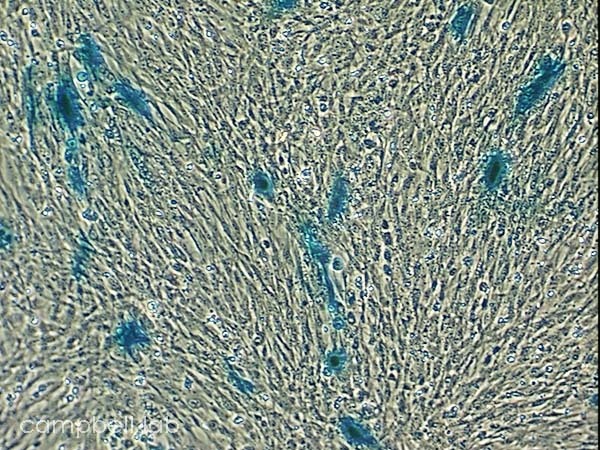 This is a human carcinoma continuous cell-line. When samples are positive for HSV, cytopathic effect is generally present within one to three days. It is rare, but sometimes one to two weeks is necessary to isolate HSV in cell culture. Cell culture will confirm an HSV diagnosis but it may not provide timely results for immediate patient care. All virology laboratories can offer cell culture isolation for HSV. ELVIS™ (Enzyme Linked Viral Induced System) is another cell culture test but the results are ready in ONE day. 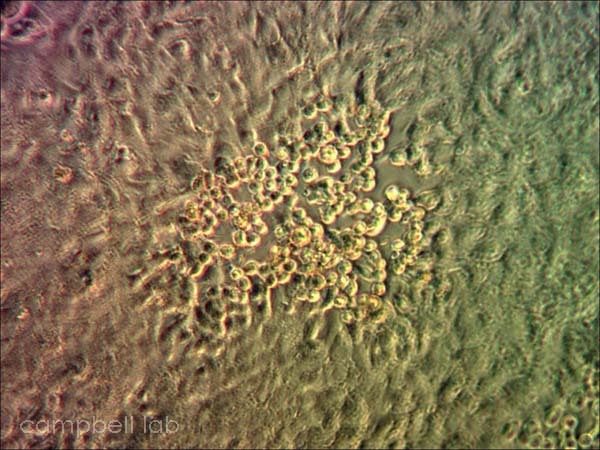 Cells infected with HSV commence a cascade of reactions that results in the accumulation of beta-galactosidase in the cells. Viral samples are layered on the specially engineered cell line in a shell vial and centrifuged. The vial is incubated for one day (overnight), fixed, and stained with a substrate that reacts with the beta-galactosidase. The reactions result in a blue-color change in the cells that are observed with an inverted microscope. ELVIS™ testing may also be limited in its availability.